I’ve always been quite jealous, when watching TV cooking shows, to see chefs quickly whip up crispy, parmesan wafers, that add an inexplicable flare and crunch to even the most boring dishes. Like a Caesar salad. All it takes is a grater, a block of parm, and a non-stick baking sheet. But due to parmesan’s high sodium content, to make and enjoy this treat also requires a body that is not salt sensitive. So parmesan wafers were out. But as usual, when I’m told no, I become even more obstinate and determined to find a solution. 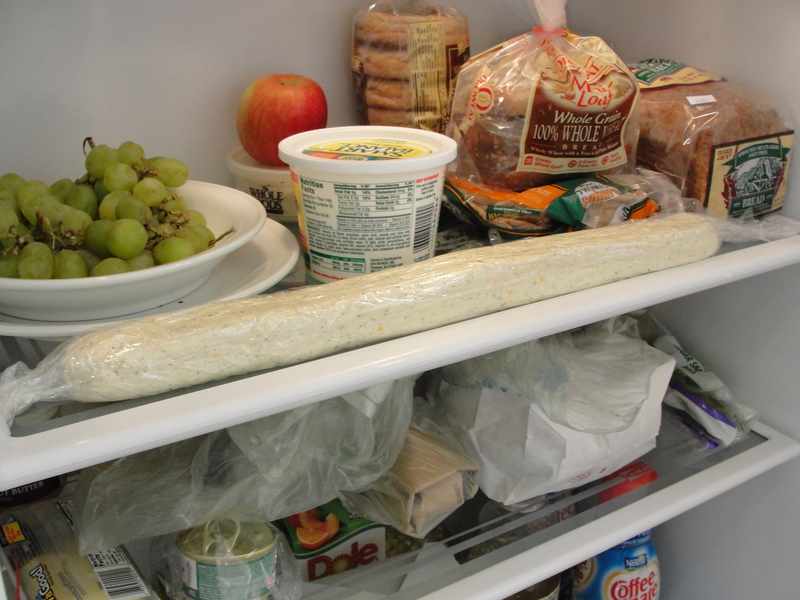 It just so happened that I have become recently addicted to ricotta cheese, which is generally quite low in sodium. 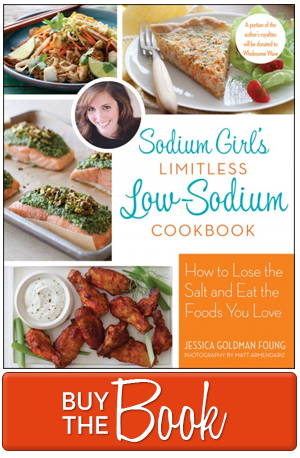 The particular brand I have been using is only 24 mg of sodium per 1/4 cup. Scoops of this creamy concoction have found their way into my risotto cakes, pasta, and weekly frittatas. Yes, I said weekly. With ricotta clearly on my mind, and in my fridge, I thought, perhaps I could make a cheese wafer/cracker/biscuit out of this low sodium product. 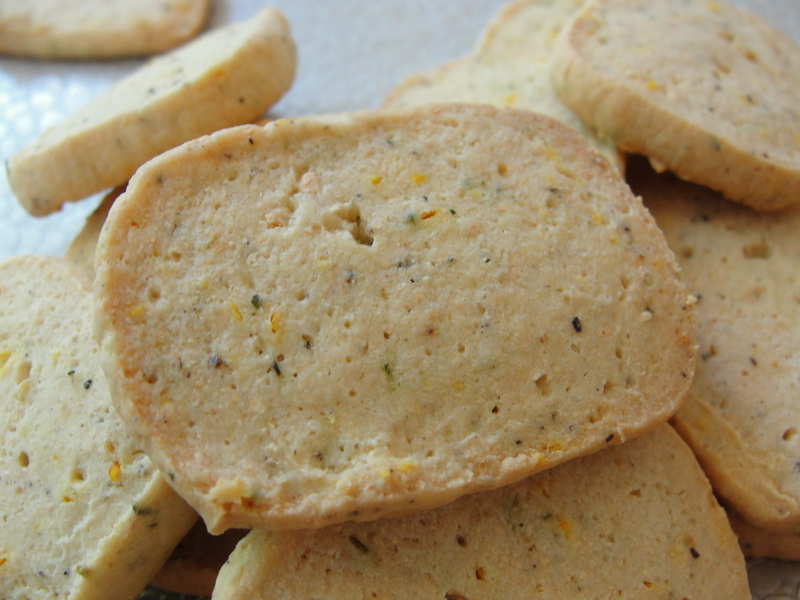 A little interweb searching landed me on the Food Network’s website and a wonderful recipe for parmesan and thyme crackers by the always adorable, always delicious Ina Garten. 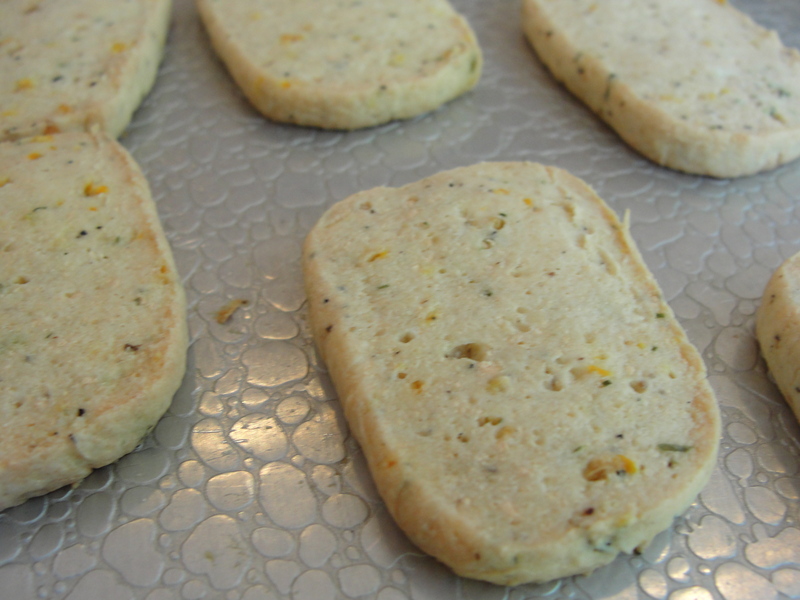 From there, I traded ricotta for the parmesan, took out the salt, and added a few more herbs and orange zest to create the ideal low sodium, ricotta cheese cracker. 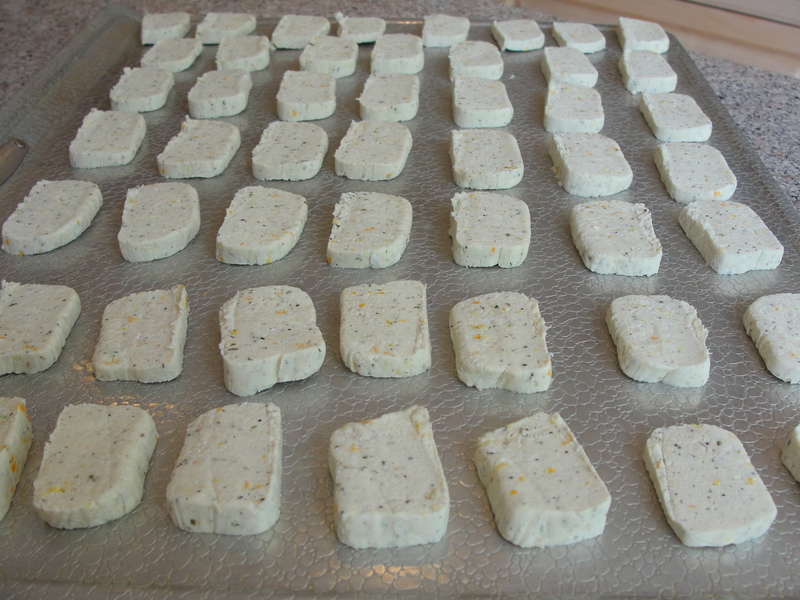 In a mere hour, with very little prep or clean up, I had a set of freshly baked, crackers that were as gorgeous as Ina’s, if I do say so myself. 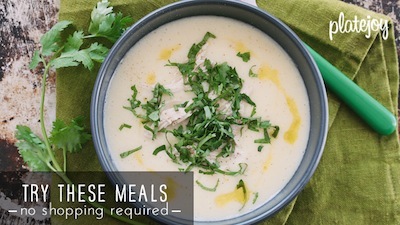 I cannot wait to make these for my next food gathering. As cheese and crackers are always a staple appetizer at these events, I’m pretty sure you cannot go wrong with a combination of the two. It’s like the culinary equivalent of the spork – great separate, but better when together. So get cracking. Have a great weekend and chow on. 2. 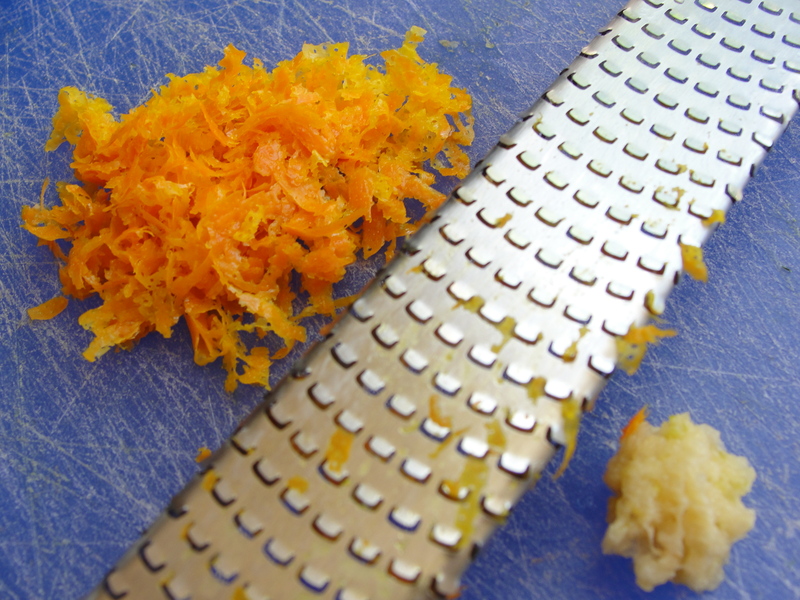 Grate garlic and orange using a microplane. 3. 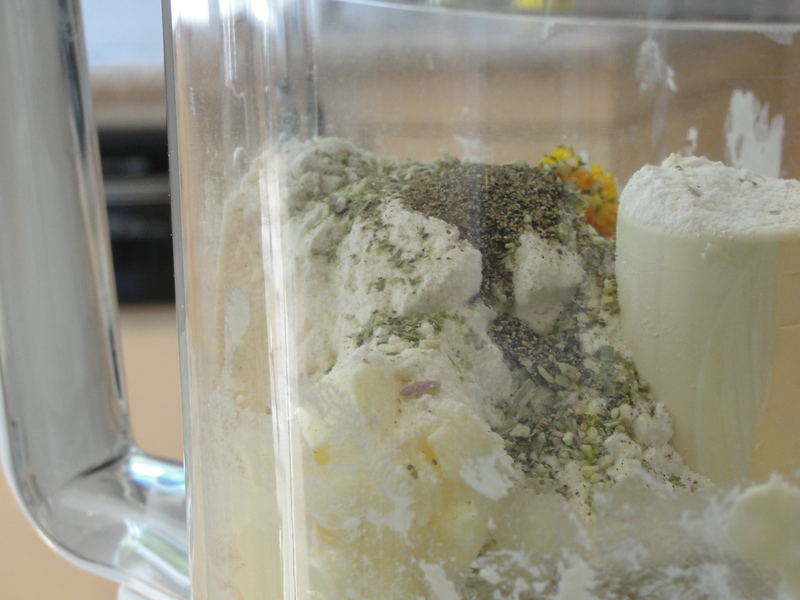 Place the butter and flour in a food processor and mix until creamy. 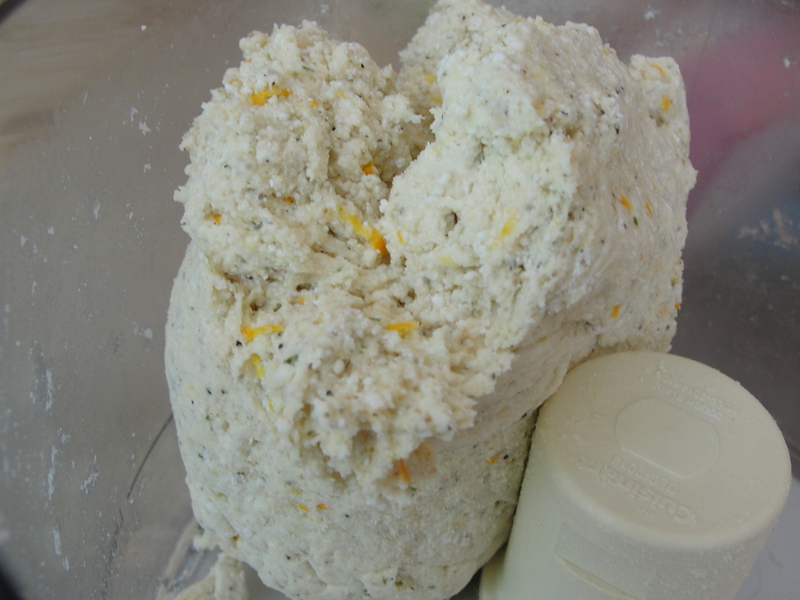 Add the ricotta, herbs, pepper, mustard, orange zest, garlic, and juice and combine. 4. Dump the dough on a lightly floured board. 5. 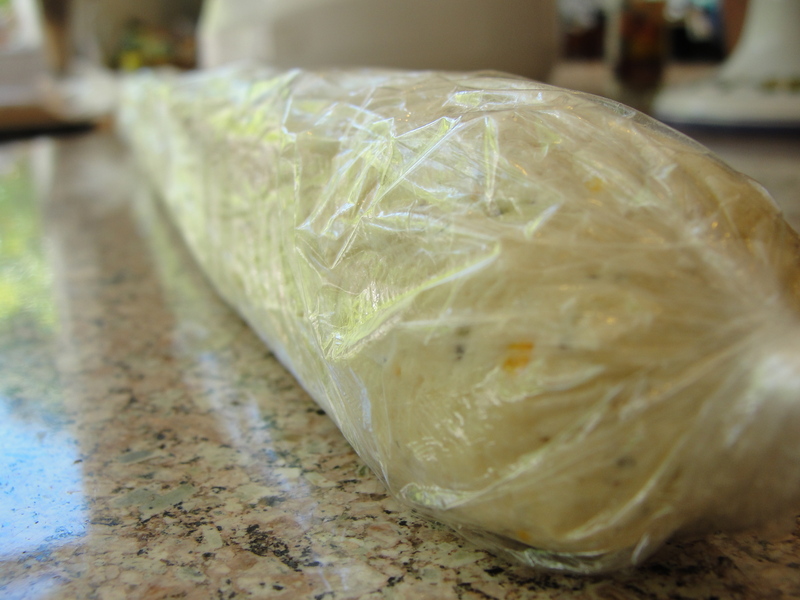 Roll into a 13-inch long log and wrap in plastic wrap. 7. Cut the log crosswise into 1/4 to 1/2-inch thick slices. Place the slices on a sheet pan and bake for 25 minutes.